Since getting my Ultimate Portion Fix Certification I seem to have become obsessed with FIXATE recipes. And since many of the girls in my Bunco group are Beachbody fans as well, I thought it would be fun to plan the menu around the healthy FIXATE recipes so they can give them a try. The great thing about Ultimate Portion Fix is that you can still enjoy treats like dessert and wine. Which as you know is a Bunco menu staple. If you take a look at my container counts you’ll notice I saved some yellows for the evening. It’s all about planning ahead. I’m doing a pajama party theme for Bunco so I’ve chosen more brunch-type items for the menu. You can find these recipes in the FIXATE & FIXATE2 Cookbooks. If you have Beachbody On Demand then you have access to the original FIXATE cookbook under the nutrition tab. You can also purchase the original FIXATE cookbook through Beachbody or Amazon. The FIXATE2 Cookbook is currently only available through the Ultimate Portion Fix program. The cookbook will be available for purchase outside of the program beginning May 31st. The weekly menu is a word doc so you can download and make changes to suit your needs. Just click on the image below to download, edit and print. 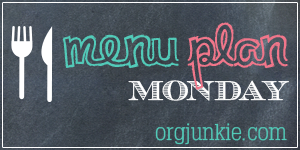 I’ve included the regular menu format and I am still doing the Ultimate Portion Fix Carb Cycling Modified Meal Plan this week to get ready for my Rangerette reunion over the weekend so you will find that template below as well.